Read this eBook and learn about the different types of call and announced bets in the casino game of Roulette. In this eBook you will also find more detailed information on various announced bets in Roulette such as the Jeu zero bet. The sections available in the eBook are listed as follows: Roulette Call Bets, Roulette Announced Bets and the additional section named Recommended Resources. 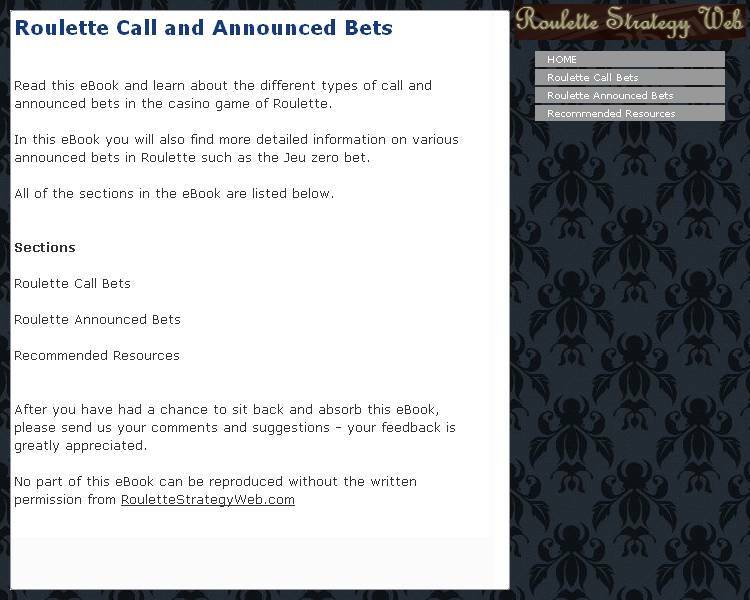 ...... to the eBook and will explain the use of call bets in Roulette. The Roulette Announced Bets section will provide you with information on what an announced bet is as well as the various general types of announced bets. The Recommended Resources section includes some accompanying links for the enthusiastic Roulette player to explore the game of Roulette further. Qweas is providing links to Roulette Call & Announced Bets 1.000 as a courtesy, and makes no representations regarding Roulette Call & Announced Bets or any other applications or any information related thereto. Any questions, complaints or claims regarding this application Roulette Call & Announced Bets 1.000 must be directed to the appropriate software vendor. You may click the publisher link of Roulette Call & Announced Bets on the top of this page to get more details about the vendor.